The Norman is not the first Twenties townhouse to be converted into a chic boutique hotel near Rothschild Boulevard, the happening heart of the White City. 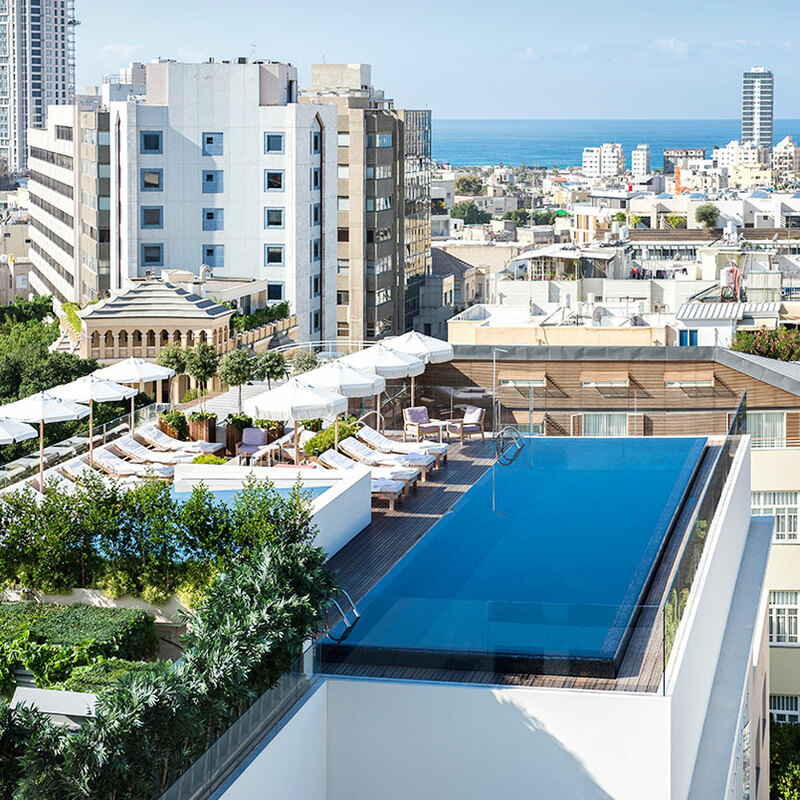 Rothschild is the main promenade running through a neighborhood famous for its Bauhaus-style architecture and lively outdoor cafés, and it’s the perfect place to open a small and stylish hotel — which is exactly what a handful of enterprising Israeli hoteliers have been doing. What sets the Norman apart? Well, do the words “rooftop infinity pool” mean anything to you? But let’s start with the basics. The Norman is housed within a pair of adjacent apartment buildings constructed in the 1920s — one has a decorative yellow facade, the other is pale blue and modernist — across from King Albert Square. The fifty exquisitely restored guest rooms and suites are stylish and contemporary, with an art deco twist: hardwood floors, floor-to-ceiling windows, modern bathrooms. Some have artistic details like hand-painted tiling, others feature private balconies and separate living areas. And the two Penthouse Suites? Those come with private terraces, outdoor hot tubs, and panoramic views over the city. But back to that rooftop pool for a moment: it’s one of several appealing public spaces at the Norman. The hotel has two restaurants, the signature Norman, serving French Mediterranean cuisine and featuring a Champagne bar, and the Japanese-inspired Dinings. Just off the lobby is the cozy Library Bar, with design and cocktails — like the Pomegranate Mint Julep, the Norman’s whimsical signature drink — that evoke Tel Aviv’s 1940s colonial era. There’s an actual library here, not to mention part of the hotel’s small but noteworthy Israeli art collection. If you’re interested, the hotel’s resident curator can help arrange visits to local artists’ ateliers: it’s a window into local culture you’ll likely appreciate if you've found your way to this particular part of town.